This 5 reel and 15 payline slot from Playtech is aptly called Wild Wishes. Although it is not mentioned in the game, the theme is very reminiscent of the Disney classic 'Aladdin'. The game is set in the Middle East with a Taj Mahal type building dominating the background. The characters are very similar to Aladdin, Jasmine, the Genie and the Evil Magician from the Disney movie. Other symbols on the reels include a Cobra in a basket and a set of Cutlasses. 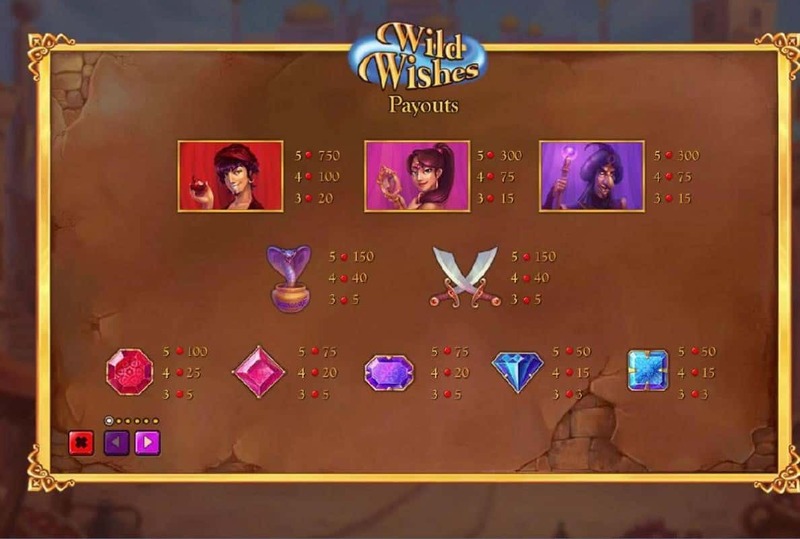 The Free Spins round in Wild Wishes is available to play when you land a winning spin. There are 5 lamps on the top of the reels and when you land a winning spin the left-most lamp will light up and you receive a free re-spin. If you land another win, the next lamp lights up and another free spin is awarded. This cycle continues until you land 4 wins in a row, where you are awarded 7 free spins. 5 winning spins awards the maximum amount of 50 free spins. The Magic Lamp Feature is only active during the Free Spins Rounds. The mystical blue genie comes out of the golden lamp in a cloud of blue smoke. The smoke disperses and you notice that he has covered several standard symbol positions and turned them into additional Wilds. During the Free Spins, the Wilds also appear on all 5 reels as opposed to just 1, 3 and 5 as in the base game. This feature gives you the option to keep the first lamp always lit up. All you need to do is press the 'Feature' button at the bottom of the reels to activate it. This feature costs you an extra 40% of your bet but the winning potential is worth it as you will receive a free re-spin for every win and there are less lamps to light up to receive the maximum free spin amount. Wild Wishes has all the fun and excitement that game with this kind of narrative should. Before you can join in, in all the thrills and suspense you'll have to place your bets. This is done by selecting which paylines you wish to activate and betting per payline. Pressing the spin button will get the ball rolling and if you are one of those players who prefer to sit back and relax then the auto-play function will help you out. Red Jewel, Pink Jewel, Purple Jewel, Blue Jewel, Turquoise Jewel, Cobra, Cutlasses, Aladdin, Jasmine, Magician. The Scatter in Wild Wishes the L Magical Lamp, it appears on reel 1, 3 and 3 and it is the symbol responsible for unlocking the Bonus feature. The Wild is the symbol is the Blue Genie. It can replace all other symbols except for the Lamp Scatter. It is also stacked on all the reels. 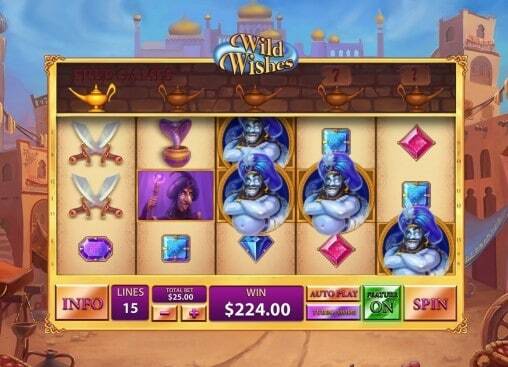 Wild Wishes is possibly one of Playtech's most aesthetically pleasing online slot games. It is clear that great care and effort has been put into the overall design of the game, making it a beautiful Arabian-themed slot game. The features may take a little while to get used to, especially for novice players, but once you get the hang of how the features work you should fully enjoy their unique aspects.